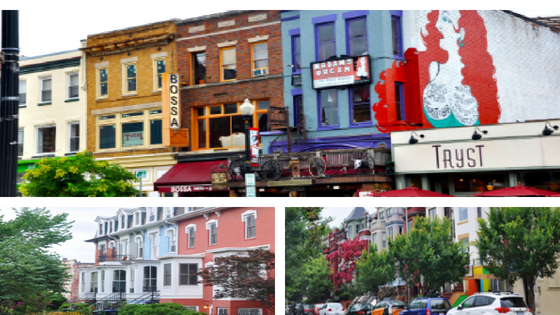 Homes, Townhouses, and Condos For Sale In Adams Morgan, DC. Adams Morgan is located in Northwest D.C. between the National Zoo and DuPont Circle. The neighborhood is named after Thomas P. Morgan Elementary School and John Quincy Adams Elementary School. Adam’s Morgan has remained one of the most culturally diverse neighborhoods in the D.C. area, which is reflected in the local cuisine and shops. Other popular neighborhoods such as Kalorama, DuPont Circle, Woodley Park, U Street, and Mount Pleasant border it, making Adam’s Morgan a central hotspot. A celebration of cultures has greatly influenced Adams Morgan. The diversity is what gives this neighborhood its distinctive flavor and incredible edge. The restaurants feature cuisine from all over the world, and there are popular bars, live music, and dancing venues, which draw in an eclectic crowd. The main staples of Adam’s Morgan are along 18th Street NW, which include local shopping featuring unique items. Despite being popular for its nightlife, Adam’s Morgan has great coffee shops, parks, Washington DC real estate and boutiques for people with varied interests. 19th and 20th century row houses add to the neighborhood’s character, and also make up the majority of available housing. Renovated lofts and condos are being built throughout the area adding an upscale flair to this already hip neighborhood. Due to recent growth, and the addition of new housing, prices for housing in this neighborhood have been on the rise. The median list price for homes is about $599,000. A direct metro stop does not service Adam’s Morgan. The nearest metro stop is Woodley Park/Zoo on the Red Line, which is about a 15-minute walk. The Green Line station in Columbia Heights, the Yellow and Green Line along U Street, and the Red Line at DuPont Circle station are other nearby metro options. There are many public school options in the Adam’s Morgan area such as: Marie- Reed Elementary School, H.D. Coke Elementary School, Lincoln Middle School, The School Without Walls, and Wilson High School. Great Schools Adams Morgan, D.C.